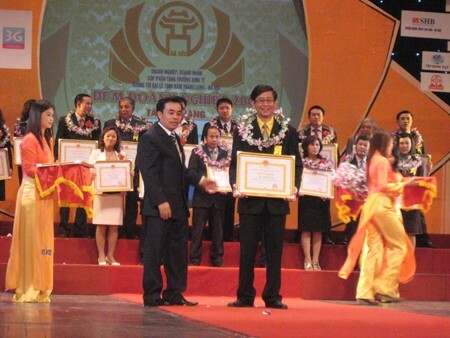 In the everning of 2-Dec, 2009, at the Hanoi Opera House, Hanoi People's Committee and the Hanoi Small and Medium Business Association organized "Night of Ha Noi Gold Outstanding Enterprise and Business 2009". The participants were Deputy Permanent Prime Minister Nguyen Sinh Hung, Deputy Chairman of Hanoi People's Committee Nguyen Huy, the leaders of the Party and Hanoi City, and other Hanoi enterprises. At the ceremony, Mr Nguyen Sinh Hung awarded Second-class and Third-class Independence Medal, Second-class Labour Medal, Third-class Labour Medal for excellent individuals and organizations . 13 organizations and 9 individuals were awarded Prime Minister Certificate of Merit. 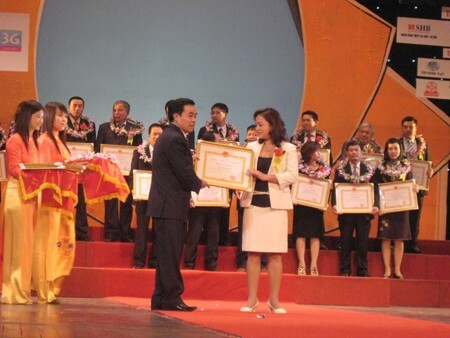 To record the achievements of businesses and entrepreneurs, Hanoi People's Committee awarded Certificate of Merit for 19 organizations and 17 individuals; while 32 organizations and 8 individuals were awarded “Ha Noi Gold Outstanding Enterprise and Business 2009” from Hanoi Small and Medium Enterprises Association. Company TrungThanh honorably received Certificate of Merit from Hanoi City People's Committee for excellent organization and Mr Phi Ngoc Chung received Certificate of Merit for Outstanding Busimessman.Besides, Hanoi Small and Medium Enterprises Association awarded TrungThanh the Cup “ Golden Outstanding Enterprises” and the Cup “ Golden Outstanding Business” to Mr Phi Ngoc Chung. Mr Do Quang Hien, the Chairman of Hanoi Small and Medium Enterprises Association, said: "This is an important event which is held annually to honor and encourage outstanding businesses and entrepreneurs ofHanoi who achieved outstanding success in production and business in 2009. This is also a chance for the businesses and entrepreneurs to meet and promote relationships, thus contributing to economic and social growth of Hanoi. In his speech, Deputy Chairman of Hanoi People's Committee Nguyen Huy Tuong praised the contribution of Hanoi enterprises, encouraged them to welcome 1000 years of Thang Long - Hanoi.